Market Day is supported by generous sponsorships and donations by local businesses and supporters. To discuss how your business can reach a broad audience of 3,000+ people at Market Day, contact us at marketday@newtownhistoric.org. Gain tons of exposure by booking a sponsorship months in advance. The main feature of Market Day is the shopping! We sell vendor spaces to approximately 50 high-quality crafters & artisans who make and sell their own handmade items. Only those who are selling their own hand-made art or crafts will be considered. Anyone selling crafts made from kits, imports, manufactured or retail merchandise will not be accepted. Crafters/artisans are selected through a review process. We are full, but are accepting waitlist applications from Crafters/Artisans who want a booth at the 2018 event. Please complete this form (credit cards accepted). Be prepared to upload photos of your craft or artwork. If we cannot fit you into our event, your application fee will be refunded in full. To be emailed about reserving a crafter/artisan booth at next year’s event, please subscribe to our mailing list. We welcome inquiries from local farmers who want to rent a space to sell their seasonal fresh fruits and vegetables. Limited space is available. 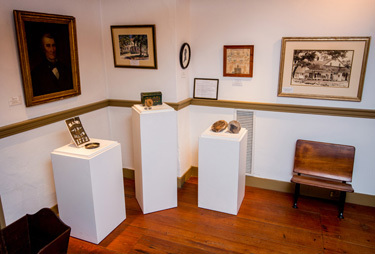 We love to present reenactments & demonstrations of colonial-era trades & handiwork, such as military encampments, woodturning, candle dipping, blacksmithing, cooking, quilting, toy making, and anything else from the colonial era that draws the attention of guests of all ages. Wearing your own colonial outfit is highly recommended. Most demonstrations are held outdoors; limited space inside the Half Moon Inn could be available. We welcome local restaurants & supermarkets who have the resources & equipment to cook & sell food to hungry guests of all ages! Our tight, colonial streets do not allow for food trucks or other vehicles to be parked on the street during the event. All booths serving food must pass that morning’s health inspection. Who doesn’t love fun and games? For those guests who want to explore, participate, or just sit and listen, we welcome ideas from performers who can entertain a crowd of any or all ages! From folk music and puppet shows to playacting and craft making, let us know what you have to offer that fits into the Market Day theme of carrying on colonial traditions. Market Day is held outdoors on pavement and all vendors supply & install their own furniture & tents. We typically welcome 3000 visitors, but it depends on the weather. Electricity and Internet access are not available. There is no rain date for the event, and the event could be cancelled by organizers due to moderate-to-light precipitation, high winds, or other precarious situations. The event has a history of remaining open during damp, cold, and light drizzle conditions. Vendor move in begins at 7:00 am the morning of the event, and tear down cannot happen until 4:00 pm, or when event organizers officially close the event, whichever happens first. All vehicles & trailers must be removed from the event area and parked off-site prior to 8:30 am. Parking in Newtown is free. Most vendors are placed adjacent to private residential properties; please be respectful of your assigned space, and please remove all trash when leaving. Market Day hosts Revolutionary War reenactors who may periodically discharge their weapons using blank ammunition. This noise is loud and can be startling, especially to infants & dogs. Other than colonial demonstrators & reenactors, vendors are not required to wear colonial era costumes – although it can elevate your interactions with guests. Newtown Borough Police will be present at this event; please report all suspicious and disruptive activities to police officers. For more information about participating in Market Day, please contact us at marketday@newtownhistoric.org.